You can register data directories and databases with an ArcGIS Server site from ArcGIS Pro, ArcCatalog, or the Catalog window in ArcMap. Data registration provides the server with a list of locations for your web services' source data. Data registration helps you validate that your services will reference data locations known and approved by the server administrator. Registering your data directories does not grant the ArcGIS Server account permissions to access your data. You need to give the ArcGIS Server account at least read permissions to any folder that you register. If you register a database (including enterprise or workgroup geodatabases), the type of permissions you need to grant depends on the type of database and authentication method you use to connect. See Make your data accessible to ArcGIS Server to learn more about the scenarios where you need to apply permissions. For more information on the requirements for registering a database, see the topic specific to your database management system in the list below. Note that if the database does not contain a geodatabase, it cannot be registered as a GIS Server site's managed database. You cannot register a Db2 database on z/OS or an Informix database with ArcGIS Server. To publish from these databases, create a service definition file that does not contain the service data, and publish the service definition file. Use of Altibase with ArcGIS is deprecated. 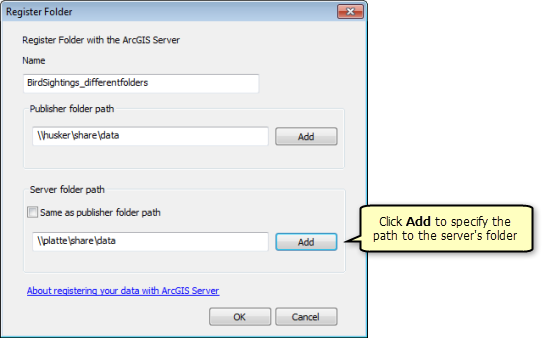 Follow the steps in the sections below based on what you want to register with the ArcGIS Server site. You can register databases that contain enterprise or workgroup geodatabases and databases that do not. See About registering your data with ArcGIS Server for information on the registration scenarios you can use for each. Follow these steps to register a database with a publisher or administrator GIS Server connection. When you subsequently publish web services that contain data from this registered database, the services will reference that data rather than copying it to another location. For SQLite databases and file geodatabases, use the option described in the subsequent Register a folder section. Confirm that the 64-bit version of the database's client software is installed on each ArcGIS Server machine in the site before registration. Right-click your administrative or publisher-level GIS Server connection in the Catalog tree and choose Server Properties. See Connect to ArcGIS Server from ArcGIS Desktopfor more information. Click the Data Store tab in the ArcGIS Server Properties window. Click the Add button next to the Registered Databases dialog box. Provide a unique name for the registered database. Names can be alphanumeric and can contain spaces. Specify the database connection for the publisher. If you've already configured a connection to the publisher's database, click Import to choose a connection file (.sde or .odc only). The default location is C:\Users\<user name>\AppData\Roaming\ESRI\Desktop<version number>\ArcCatalog. If you need to create a connection to the database, click Add next to the Publisher database connection section to specify the publisher's connection type, properties, and authentication mode. If you need help adding a connection, see Database connections in ArcMap. If the publisher's machine and the server are working with the same database, click the Same as publisher database connection check box. 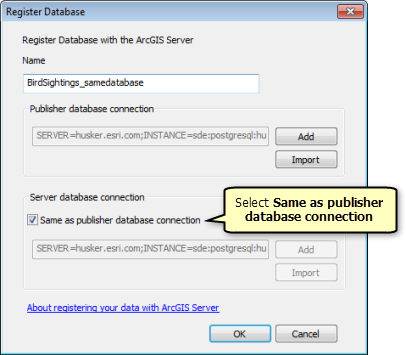 This specifies the publisher's machine, and ArcGIS Server will view and access data residing in the same database. To learn more about this scenario, see About registering your data withArcGIS Server. If the publisher's machine and the server are working with different databases, click Add next to the Server database connection section to specify the publisher's connection type, properties, and authentication mode. If you've already set up a connection to the server's database, click Import to choose a connection file. If you're using an enterprise or workgroup geodatabase for both the publisher and server databases, you can optionally click the Create geodata service check box. When you choose this option, a geodata service is automatically created for the server's enterprise geodatabase. You can use this geodata service to send a replica of the data from the publisher's enterprise geodatabase to the server's enterprise geodatabase (thereby populating the server's database) and later use it to synchronize changes between both databases. 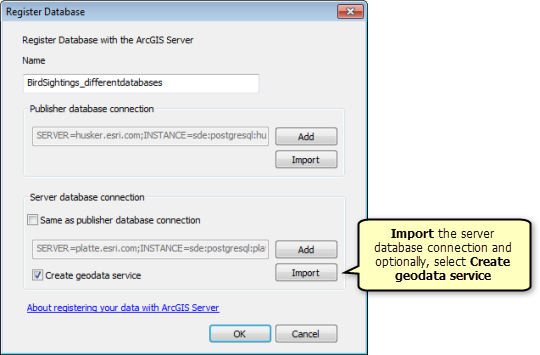 To learn more about this scenario, see About registering your data with ArcGIS Server. The database (or databases) you registered appear on the Registered Databases dialog box. You can register a local file directory or shared directory that contains GIS resources and data, such as shapefiles and file geodatabases. When you register a directory, all subdirectories under the folder you specify are also registered with the ArcGIS Server site. Use the Manage registered data stores pane to register a folder from ArcGIS Pro. See Manage registered data stores in the ArcGIS Pro help for instructions. Click the Add button next to the Registered Folders dialog box. Provide a unique name for the registered folder. Click Add next to the Publisher folder path section to specify the path to the publisher's folder. If the publisher's machine and the server are working from the same folder, click the Same as publisher folder path check box. 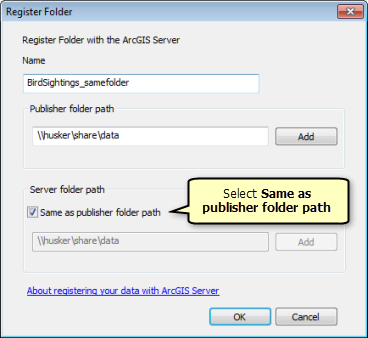 This specifies the publisher's machine, and ArcGIS Server will view and access data residing in the same folder. To learn more about this scenario, see About registering your data with ArcGIS Server. If the publisher's machine and the server are working from different folders, click Add next to the Server folder path section to specify the path to the server's folder. To learn more about this scenario, see About registering your data with ArcGIS Server. The folder or folders you registered appear on the Registered Folders dialog box. Using the tools on the Data Store tab, you can register an enterprise geodatabase as a stand-alone or federated GIS Server site's managed database. You must create this database before you can register it. To learn more about managed databases and scenarios for using one, see Copy data to the server automatically when publishing. This workflow is not supported if the GIS Server is a hosting server for an ArcGIS Enterprise portal. Next to the Registered Databases dialog box, click the drop-down arrow next to the Add button and choose Register Database as ArcGIS Server's Managed Database. Provide a unique name for the geodatabase connection. Click Add next to the Server database connection section to specify the connection to the managed database. If you've already set up a connection to the database, click Import to choose a connection file (.sde). If you need help with adding a database connection, see Database connections in ArcGIS Desktop. The managed database is registered to the GIS Server site and appears on the Registered Databases dialog box. Database passwords, like other software and system passwords, are frequently changed for security reasons. If the password saved in the database connection file (.sde) that you registered with your ArcGIS Server site changes, create a new database connection file containing the new password, and edit the existing data store registration to point to the new file. This updates the registration for all services except search, stream, Workflow Manager services, and geoprocessing services published prior to ArcGIS 10.4. Right-click your administrative or publisher GIS Server connection in the Catalog tree and choose Server Properties. Choose the registered or managed database from the Registered Databases list and click the Properties button . You cannot edit the connection for an ArcGIS Data Store managed database. To update a password for ArcGIS Data Store, use the changepassword utility. Click Edit next to Publisher database connection to change the password for this connection. Type the new password for the connection and click OK. If a different connection is used for Server database connection, click Edit next to this connection, type the new password, and click OK.
Click OK to save changes to your registered or managed database connection. Restart the services that were published from the registered database, or restart the feature services published to the managed database. Restart any geoprocessing services published from ArcGIS Server 10.4 or later. Geoprocessing services published from previous releases of ArcGIS Server must be republished to use the new password. Services published from the registered database or feature services published to the managed database can access data again. You must republish search, stream, and Workflow Manager services, and any geoprocessing service published to an ArcGIS Server 10.3.1 and earlier release to update the password.